You can’t walk past a group of marketers without hearing the phrase “content marketing” seven times. That’s a slight exaggeration, but content marketing continues to be a buzzword we’ll hear this coming year – and for good reason. Content marketing is cost-effective, positions you as an expert, and helps convert cold leads to hot. In a B2B context, content marketing is supplying the right information to your customers and prospects … at the right stage of their buyer journey. Or sales funnel, whichever way you think of taking a prospect from cold to hot. First you need a writer. Preferably someone who can write for the web (understands search, links, etc.) An outside agency will be happy to step in and help you, though hiring someone will prove cheaper if you want to produce a lot of content. Let’s back up – why would you want to do content marketing, besides reach and cost-effectiveness? Being a rich industry resource does wonders for credibility and company reputation, sales, and even search marketing. Volume producers of high-quality content usually rank well on Google for important company searches, and prospects engaging with your content are apt to consider you an expert. We all know by now that the majority of a sales decision is made in advance of speaking to an actual person – this is why content becomes so critical. Start a content map that can serve as an editorial calendar / publishing guide, then begin to lay out content that makes sense, and is within your capabilities to produce. Maybe people new to your brand would enjoy fun, short YouTube videos. People who want to buy, but just need to give themselves permission to do so: This group might need a case study or white paper. 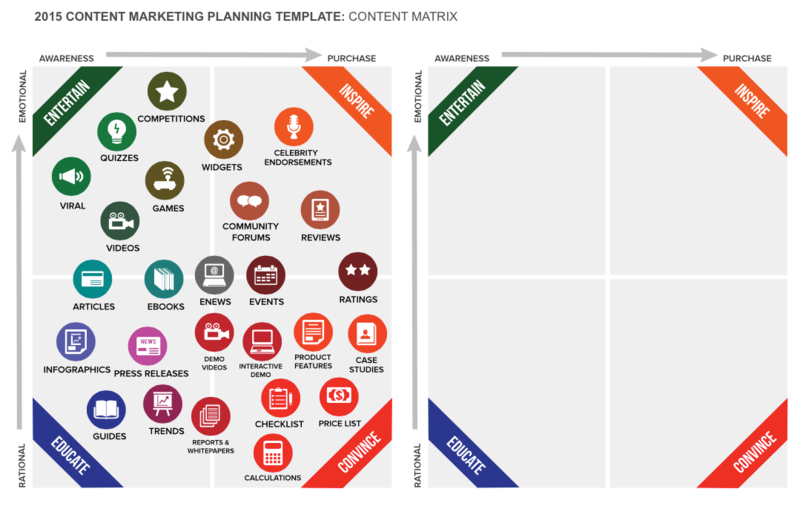 This is a great content marketing planning template courtesy of Smart Insights and Hubspot. A simple spread sheet works fine, as well! As you are building your content and planning its release, be building your distribution channels. Sales is an obvious place to introduce and use your content; you can turn a blog post into a sales sheet, into an email pitch, into a tweet … all fairly easily. LinkedIn and Twitter need nurturing, but provide a payback in terms of site traffic and sales leads. SEO is another channel to consider when creating content. Anticipate what your customers need, and how they might search for that need. If your content is solving customer problems, then your blog posts will rise to the top of searches on that topic. Google is rewarding conversational, customer-friendly content, so a How To series might be a good place to start. Once you are publishing and distributing, be sure to measure your activity. Google Analytics is an easy way to see which pages and what content are getting the most views. Google analytics can usually be as easy as installing a plug-in on your website. One final piece of advice for jumping into content marketing: If you sincerely focus on creating quality content that solves your customers’ problems, and addresses their pain points, it’s hard to go wrong.